We’ve completed Mom’s move to Neil’s and my house in North Carolina and she’s settled in wonderfully. She wanted to come see her old house before we closed so as I write we are in a hotel in Arvada. We’ve texted, but I want to write to thank you and your team for the gift of Mom and Dad’s ability to live in their home until the end (for Dad) and until the move to our house (for Mom). It was so important to Dad that he stay at home yet there was no way Mom could have cared for him and for herself without your team’s help. It’s quite a responsibility to take care of Dad / Mom plus run the house. Even with my being out of state I was confident that my loved ones were always loved and well cared for. We could not put a price on the peace of mind that brought me, and I want to thank you and our caregivers again for that. I still can’t believe our good fortune that Neil and I found you when we went looking for care. I appreciate so much that you, personally, kept me informed and talked me through many challenges and changing needs. I needed the advice and your vast experience provided a wealth of information. I so appreciate your attitude and action that any caregiver that wasn’t a fit could be changed. We tried not to be too picky. I suspect your policy may not be so firmly in place at other companies, and once again am so glad we found you. Your model of helping, lately, my Mom, live her life happily and to the fullest moment by moment is a model that I now consider my gold standard when finding help in North Carolina. Know that your company meets and exceeds our highest expectations. Once again, thank you from the bottom of my heart. I am writing this letter of recommendation on the behalf of Toni Maldonado who, over the past year, coordinated the in-home care for my mother, Marilyn Kolar. In the early winter of 2015, Marilyn’s ability to care for herself was deteriorating and, living over 6 hours away, I felt it was necessary to find someone closer who could help manage the home front. I located Toni’s company in the Denver senior’s Bluebook and initially contracted part-time services for home visitations which included minor housekeeping and meal preparation. In late May, Marilyn was diagnosed with terminal cancer and she required round-the-clock home care in conjunction with Hospice visitations. Toni was able to schedule a cadre of wonderful people who took care of her on a 24 hour basis. Every time I spoke to my mom, or personally visited, she took the time to praise Toni’s staff and the manner in which they cared for her. Any issue that she had was immediately addressed through Toni’s office. In mid-December the refrigerator failed. Toni called me on the Saturday morning that this came to the attention of her staff and volunteered to purchase a replacement. After phone consultation and Internet searches, she and her husband personally responded to an appliance store and bought a new refrigerator for the home. A few weeks later, Toni’s husband hauled the old refrigerator away. This was one example of Toni’s personalized service that was exhibited during the time that she and her staff cared for my mother. In closing, I was very pleased with the services provided by Toni’s home health care business. I felt that my mother was receiving the best of care from her staff and Toni was always responsive to my requests and inquiries. I would not hesitate to recommend her to anyone who is considering home health care services for their family or friends. “Toni Maldonado and the caregivers at ‘DignityFirst Health at Home’ were real life savers for me, in an incredible time of crisis in my life. My father took a very sudden, dramatic decline in his physical and mental health and I was in desperate need of in home care assistance, but more importantly, advice and guidance. Toni provided support and wise counsel, for which I am grateful beyond words! I cannot fathom how I would have survived the crisis without her knowledge of not only my pending needs, but my father’s. It was her hospital recommendation which resulted in my father receiving a corrected diagnosis and the resulting correct medications. This action saved his life, literally. “My mom had a horrible life changing event … which forever will affect her and her family; she experienced a hemorrhagic stroke. No warning signs, no risk factors. Her speech, her body and her spirits have all been deeply wounded. My faith in God and my love and respect for my mom has always been present, but grew exponentially stronger from the moment I found her that Sunday. Since the stroke, I have been my mom’s voice, her energy, and handled everything from love and support to financial and medical decisions, and being the best I can be, for her best recovery. Consequently I have a lot invested in her happiness, health + well being and sense of normalcy. She matters very much in my life but also very much in the lives of so many people she has befriended and supported over the years. Her life is very important clearly. She has received and continues to receive dozens and dozens of letters and cards supporting her recovery. It is a very slow but positive journey. We made the realization that living at home was a real possibility only about a month and a half before her discharge date in June. No one guided me to think of this option, it happened because I thought and asked and learned about the choices. Thank God we chose this route because at first it seemed “aggressive” to do so, but now in hindsight it is a definite “no-brainer”; she is happy, healthy and is thriving — especially with the care giving company we hired, ‘DignityFirst Health at Home.’ Let me tell you why and how. ‘DignityFirst Health at Home’ is a company dedicated to creating an environment which enables people to get their life back. Not only is there “no place like home”, there is no place like ‘Dignity First Health at Home’; the team approach they use is unique and very effective: first, ‘DignityFirst Health at Home’ uses a holistic team of highly caring professionals, who each took the time to meet with mom and me (their nurse care manager, their social work care manager, as well as the agency owner and executive director), which was not only delightful, respectful and supportive but useful and practical. 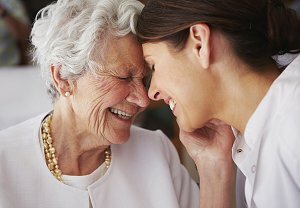 We got matched with a superb caregiver, who had not only been properly and thoroughly background-checked, but also was easy to work with mom, given the personality matching interview techniques that ‘DignityFirst Health at Home’ uses; a very solid method. Our caregiver attends to my mom on a second’s notice whenever needed. She is respectful of needed down time, and needed ‘up time’. She is a fabulous cook. She is a caring and engaged person, who encourages mom to do her rehab homework. She is a friend and a girlfriend to mom. She cares and listens. In the end, I would choose to be the caregiver mom needs if I could, but I can’t due to my job and my need to work. ‘DignityFirst Health at Home’ is the very next best thing to her having me by her side; the company shares my mom’s and my goals for improvement, their caregivers support the needed “fight” and give the needed love, …and make delicious meals (something which is up and beyond my area of expertise for sure! ).